Posted on February 1, 2018 at 3:43 pm. 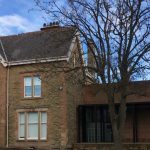 Acting on behalf of long established joinery business Aisthorpe Builders Limited, Campbell and C have sold the Freehold of the former works building, Saxon Works, to expanding advertising, design and media company, the Black Eyed Project Limited. Black Eye are relocating and expanding in to the space from their current city centre base on Rockingham Street off West Street. The company felt the time was right to secure a long term base for threw business in expanding Kelham area of the city.